Okay, Selfies are difficult! But, clearly the more you do the better you get. And, I like the fact that you always have an available model. I don’t think I can keep up with one a day, but maybe one a week! This is me really concentrating in the mirror. Graphite on paper. Tense! 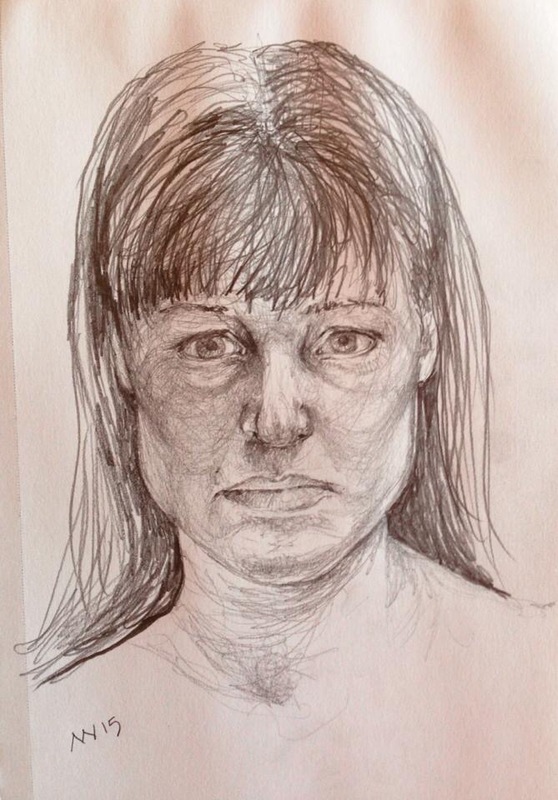 This entry was posted in #sbsseeing, #sketchbookskool, art, art journal, drawing, sketch and tagged drawing, graphite, portrait, selfie, sketchbook skool. Bookmark the permalink. This one is actually looking like you, except for the mouth. You are capturing your features better though, your jaw line, face shape, eyes. I’m sure faces are very hard. Selfies are so hard! But, I am inspired to keep working on them. That was about an hour worth of drawing. I think I need to approach it in stages for the longer drawings, I get lazy after an hour without a break!